Frankly, several ministries are working together in St. Paul, MN to help people come out of homelessness. Holistic Hardware is one of the most effective tools we have in our war chest. Bless you for writing it. Over the years I’ve received countless testimonies like the one from Pastor Jacobs. Two of the most noteworthy follow: the first from a homeless program in Wisconsin; the second from a re-entry program in Florida. I want to tell you that we are very pleased with the Holistic Hardware course that we are using for the homeless, and chronically unemployed here in Waukesha, WI. . . . On the day of graduation, we invite the businesses/organizations that we partnered with during the class to participate in the ceremony of thanking the class. Each of the graduates tells which tool was most helpful to them. Our last 2 graduations we even had the mayor come to give the welcome address. As a corrections deputy and a child of the King, it really bothered me that I kept seeing some of the same people return to our facility in St Johns County. . . . we got the Holistic Hardware DVD’s as soon as they were released. . . . I established a full time career center and continue to use Holistic Hardware for every student, regardless of their background. I took over doing the Holistic Hardware in the jail 2 nights a week, one for women, the other for men who were on work release. This is where I found fertile soul and the inmates were in for longer periods so they could get through it. Not only do I use the Holistic Hardware, I back it each week with a movie that reinforces the Tool that we are working on. . . . Our jail has really let me take many more liberties than the other programs get. And in return, they are seeing people getting out and staying out. 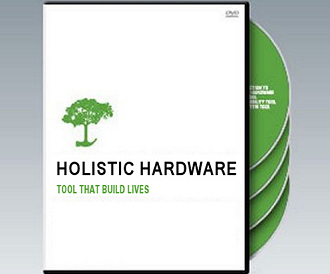 . . .Your Holistic Hardware has touched over 200 persons through NewStart. . . . I encourage as many ministries as I can to invest in Holistic Hardware and use it to help those who are in recovery, struggling with employment or if they have homeless persons as part of their church. It is a great return on the investment of $99. I’ll be preaching the Sunday morning message on February 9th at the 8 am service at Calvary Baptist Church in Ithaca, New York. You can find out more about me at josephholland.com and about HH and related products and programs at touchstonetools.com.